It is our dream to be together but circumstances seem to keep us apart. Ellen has finished her second surgery only to find the damage in her shoulder more server then expected. This means six weeks in a sling with no movement of her arm and then an undermined time in physical therapy. This is looking like it will extend her stay into September or longer. The doctors can not give us a clear answer until she has started responding to the physical therapy. This means a lot of unknowns and wait and see answers. Your prayers are appreciated during our separation and her recovery. The ministry here is going well but a bit lonely. Please pray. We have been planing this event for the past two months. It is a Kids Club expansion event. We are bringing in a number of teams to pull off a great time for the kids. We have singers, musicians, face painting and much more. It is this Saturday and we need your prayers. We are hoping the Lord will draw fifty kids to our event. There will be 18 volunteers to make this the best time every for the kids here on the island. They will parade down the streets trying to draw the kids out like the pied piper. Our kids club attendance has been around twelve kids since we started the club in January. Now we are hoping this kick off event will expand the kids club and our contacts into the community. Friday’s team will find the kids out on the streets and talk to parents. Saturday that Wayne can pick everyone up in his boat. That the river will be calm so that Wayne can return everyone back to the city. Pray for the Holy Spirit to move and change hearts with open doors. We live in a rain forest. This year the rain has not let me forget this because it seems to have stopped so many of our gatherings or plans we have made. Monday was the mens bible study, it was calm with the thunder in the distance. George the fishermen told me it was going to let lose so no one else was coming. It did just that. 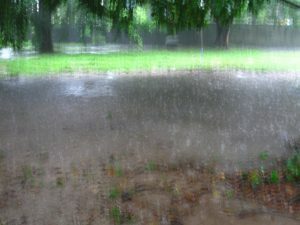 The wind blew hard and rain came down at a good rate of six inches an hour. Then their was to boat ride home last week. It was a white out. I could not see where our island was as we traveled home. One of my friends lost his cell phone because it got wet and it was in a plastic bag. The rain is just part of our life. Pray for me as I deal with the rain and lean that it is mightier then me, so it make me pause in my day as we wait for the rain to pass. The kids club is just the door we are hoping will open to give us access to the family. We are looking to have our new leaders build relationships with the families. This week we have two kids club happening one Saturday and the other Sunday. Paul writes that we are in a Spiritual Battle, and I have found this to be very true. It requires the Holy Spirit to open the door for us to access these families and that means prayer , lots of prayer. This is were you can help. We need you to pray for our two kids club programs and the visits we make to the kids homes after the program. That the Holy Spirit opens the door for us and that our volunteers can tell Bible Stories to the family along with praying for the family. It is a very important part our our ministry and it is a key role that you play. Please Pray! A Nice Long Beach – Sigh? It is a great joy that we have lots of ministry and a need for our boat. We are using the boat most weekends but, we have to get it into the water. 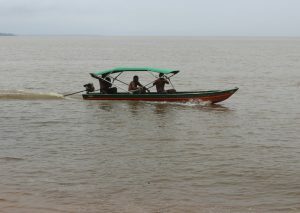 The boat is keep at my house which is a five minute walk down the beach. And I mean down the hill to the beach and then there is that long beach a low tie. Are you starting to see my point, it is a long trip to push a boat trailer, with the boat. I have also discovered I can not do this alone. It takes four our five guys to move the boat down and back. Once we hit the beach with the boat trailer it is hard to push or pull. When the beach is wet it is a drag not roll along like I had planned. So every week I find myself praying that God will provide men to move the boat. Please join me in this weekly pray that God will provide 4 men each week to move the boat and one to travel with me as I pick up our volunteers.